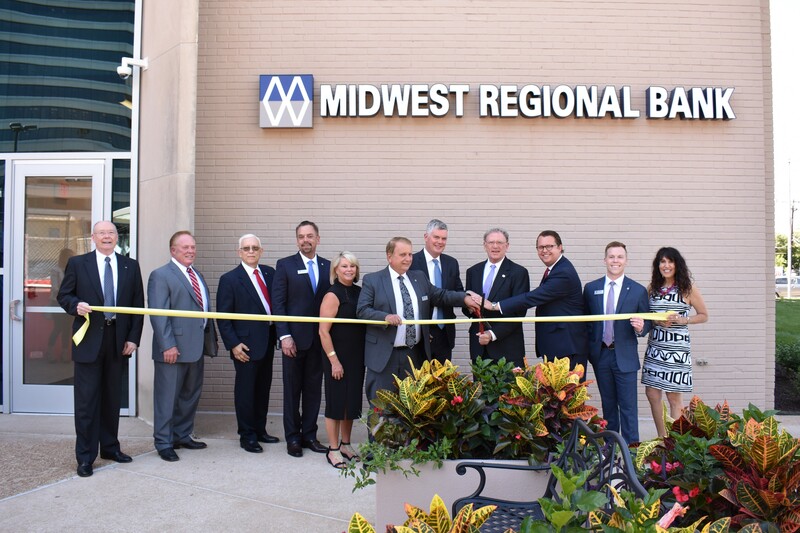 Midwest Regional Bank held a Ribbon Cutting and Open House at its newest banking center in Clayton, Missouri. Located at 135 N. Meramec Ave in the heart of Clayton, the St. Louis County seat and thriving metropolitan hub. This new branch is a part of the bank’s extension into mid-county and serves both Retail and Commercial customers. The stunning new space has a modern interior with soaring ceilings, clean lines, and bright hues. The backlit water feature behind the teller line is a focal point, and the customer lounge with a linear inset fireplace invites customers to relax while catching up over fresh coffee and cookies. The branch offers plenty of free parking and easy access ATM and Drive-Thru Lanes, setting this banking center apart from others in the city center. Sanford Scott is Midwest Regional Bank’s Area President and will lead both the Commercial and Retail operations for the market. Brandon Schmiedeke serves as the Retail Banking Manager, Brad McLaury is Vice-President, SBA/Commercial Loan Officer, and Craig Cole is Senior Vice-President, USDA Government Lending. 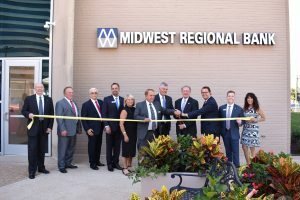 Midwest Regional Bank is a Missouri state-chartered full-service bank providing products and services to the retail and commercial markets. Operating since 1894, Midwest Regional Bank has assets of over $560 million and has Missouri offices in Arnold, Chesterfield, Clayton, Creve Coeur, Festus, Kirkwood, Otterville, Sunset Hills, and across the country in Phoenix, Denver, Tampa, Fairview Heights, Houston and Dallas.